The appraisal industry in Canada continues to be competitive and it’s clear that traditional, tried and true marketing, is critical for survival. But the explosion of digital marketing tools provide new channels to communicate and build relationships in ways that will be important to thriving in the future of the industry. 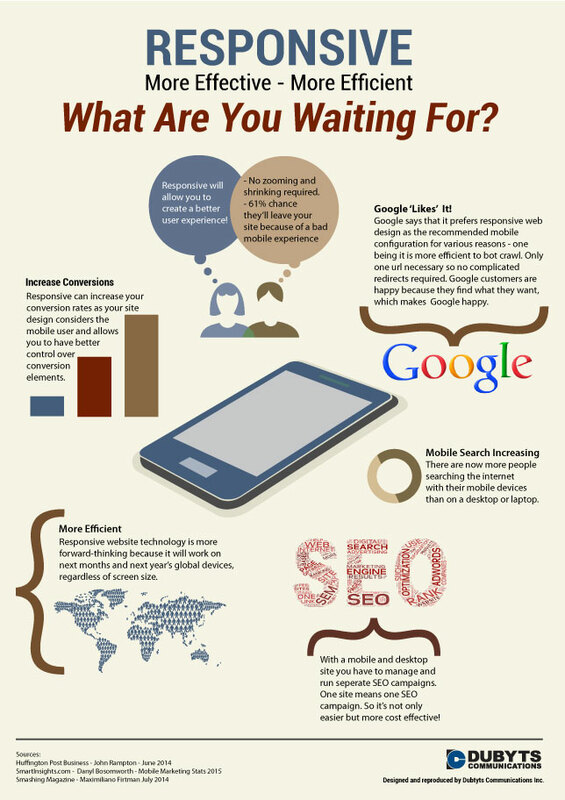 Click here to view Digital Marketing Infographic. Here are the top 10 marketing tips based on a marketing presentation at the 2016 AIC National Conference in Winnipeg, MB. The presenters: Appraisal industry professionals; Laura Kemp, Owner & Residential Appraiser, Kemp Appraisal; Glenn Power, Co-Owner, Provident Valuation & Advisory Services, and integrated marketing expert, Christine Dubyts, President, Dubyts Communications Inc. Successful companies have been building brands before branding was labeled. But many still think branding is the company logo, slogan or products. When in actuality it’s all encompassing. It’s what people think and feel about your people, products, company and service. In short, branding is what people say about you when you leave the room! It’s important to build your personal and /or appraisal company brand by design, not by default. Take a strategic approach to determine what YOU want to convey and then communicate and act appropriately in all your marketing and business dealings. What is your brand promise? What do you deliver that’s unique or different? Do you offer it in a way that’s unique or different? Do you serve a specific clientele in a specific geographic area? Do you or your team have unique qualifications? Do you offer unique or different services or expertise? If you can clearly identify and communicate your brand characteristics AND keep your promise every single time, people will eventually come to believe and trust your brand. 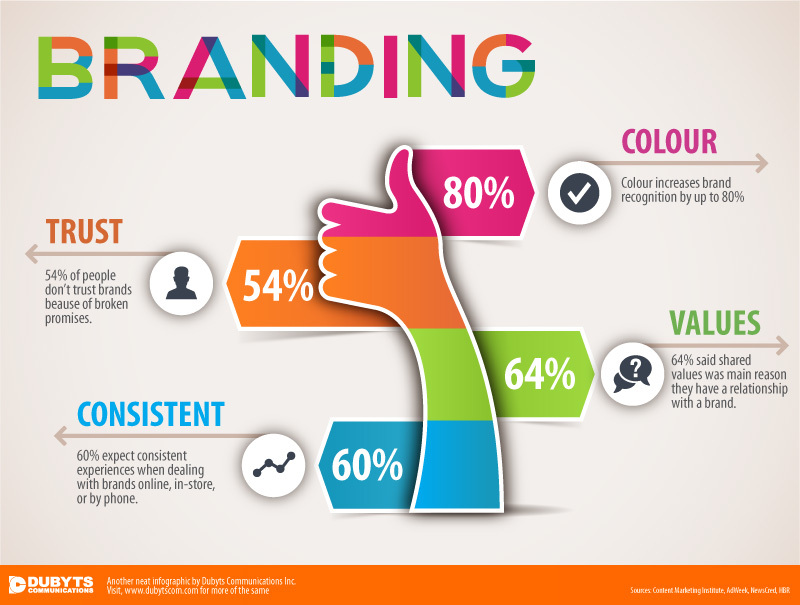 Click here to see Branding Infographic for more info. Research networking opportunities before attending. Is it a good fit for you? Will you meet and build relationships with the ‘right’ people to achieve your objectives. Be articulate about who you are and what you do. (30 second commercial). Dress appropriately – Remember, you are your brand. Become known as a resource for other people. Follow through on any connections and/or referrals you get. This is how you will build trust. Post a professional headshot – logo or picture of you with the family pet are not appropriate. Make sure your profile is typo free and professional. Click here to see more LinkedIn networking tips. Considered a low-cost marketing technique, speaking at events is a great way to build your credibility. Estimate your time to prepare and present vs the opportunities it presents. Make sure you’re presenting on a subject you’re well versed AND ensure your presentation is professionally prepared and presented. You can do yourself more harm than good if the presentation doesn’t go well. The Appraisal Institute of Canada provides industry and consumer marketing brochures for your use. They’re professional, current and perfect for events, meetings and mailouts! Visit http://www.aicanada.ca/ and go to Member Login to access a list of available resources. While you’re at the site make sure your Online Profile is current and complete. The ‘Find an Appraiser’ tool is used frequently and if you’re not listed, or your listing is incomplete you’re missing this FREE opportunity to get customers. Yes, You Do Need a Website! It is a professional representation of you and your brand. It builds your credibility. Without it you lose credibility. This is the yellow pages of the digital world. 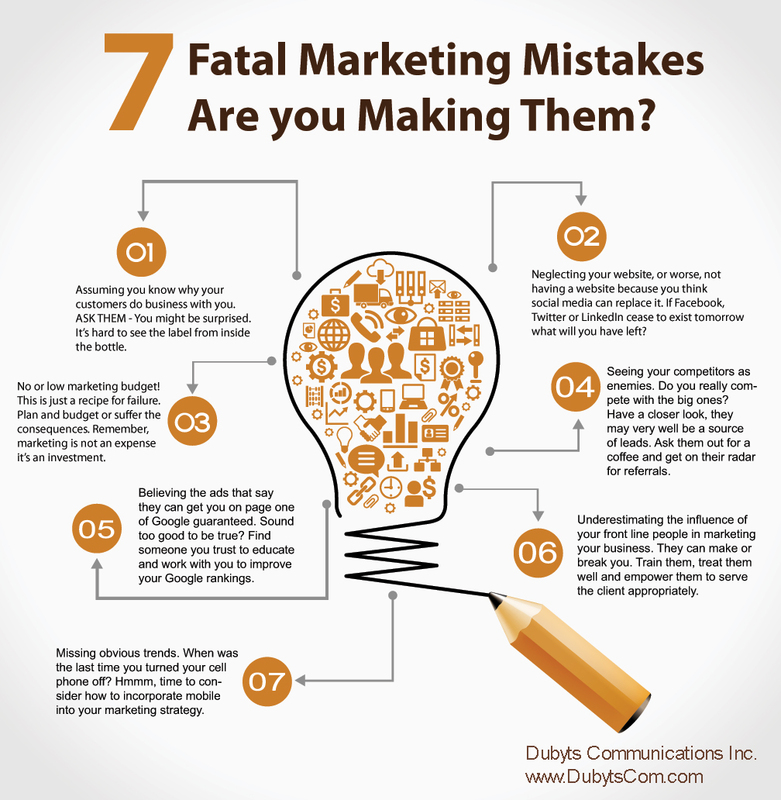 You don’t own your space on digital media sites – You’re at their mercy when they make changes or should they ‘go down.’ Click Here to see, ‘7 Fatal Marketing Mistakes’ Inforgraphic for more info (In particular #2). be verified on Google (maps). If you’re not on Google, you don’t exist! A referral is the highest compliments you can get and can go a long way to convince people you can do what you say you can do. So take the time and ASK for the referral. Make asking for referrals part of your sales process. Get the job, deliver the job, invoice the job, then ask for a referral. Unless the job went horribly wrong, then you’ll want to defer the ask for the next ‘happy’ client. Don’t limit your request to clients. Ask acquaintances, and business associates for referrals. Don’t feel pushy when asking for referrals. They won’t give you a referral unless you truly deserve it. Your clients may be bank execs and managers but they’re also moms, dads, grandpas, aunts, uncles, husbands and wives. They live in your community, shop at your grocery store and their children go to school with your kids. Volunteer at a charity event, sit on the parent association committee or take a position on an association board. You will meet new people and expand your network of influence. Who knows, the dad sitting next to you at the next PTA meeting may be your next best customer OR they may know someone who becomes your next best customer. Volunteering is a great way to give back and meet new potential clients. Pricing is an essential part of your marketing strategy. Do you want to be high volume, low margin (think Costco), or do you want to be low volume, high margin (think Range Rover)? If you have something unique to deliver, or truly offer a superior product/service (See Marketing Tip #1), you can use a prestige pricing strategy and charge more. If you’re in the middle of the pack, offering the same appraisal services to the same people as your competitors, your pricing should reflect this with a competitive pricing strategy. Or perhaps you’re using technology or have some other competitive advantage that allows you to deliver more service faster allowing you to increase your volume and decrease margins. Like any business decision this one is critical to your business model and branding. Study every point where your customer or potential customer interacts with you, your message or your brand. What do they think / feel before, during or after the experience? What impression does it leave them with? Small lending institution requires a new appraiser and discusses it at their weekly management meeting. Jeremy, loans manager, remembers seeing an insightful article posted on LinkedIn by a local Appraiser. Can’t remember the name. Arial, one of the administrators mentions she met an enthusiastic Candidate at the last Chamber meeting. Arial digs through her biz cards and finds the Candidate’s card. The card is professional with a unique design and heavy stock that makes it stand out from the rest. Arial calls the Candidate who responds with the same enthusiasm. The Candidate, now certified and a business owner, follows up the phone call with an email that includes links to her new website and referrals of her latest clients. Your dress / attire (what did you wear to that Chamber Meeting?) – Was it business professional or nightclub ready? Website – What does it look like? Broken links? Missing info? Typos? How does it compare to competitors? Quote or Proposal – Is it clear and concise? Does it present the information requested? Is it different or unique in any way? Service Delivery – How well / poorly was the job done? On time, as requested, on budget? Did you exceed expectations in any way? Post Service Delivery – What happens after the delivery of your appraisal? Is there a follow-up call/email? Anything special or unique between jobs? How do you keep in touch? Every interaction from the point where a potential client comes into contact with you or your brand will form the basis of the Total Customer Experience. As a professional appraiser working in an increasingly competitive environment, it’s important to remember that people don’t buy from companies. They buy from people. Your marketing should incorporate traditional and online channels where you can develop and build your networks of influence and develop authentic trusting relationships. Refine and differentiate your offering and deliver what you promised every single time. And at all points of contact be courteous, gracious and professional. Christine Dubyts is an honors graduate from the University of Manitoba faculty of Commerce, Marketing Major. Christine worked with successful marketing professionals in industries including, printing & publishing, IT, fashion & retail. In 1999 she launched Dubyts Communications, a full service marketing and communications company offering consulting, graphic design, branding strategy, web design and new media marketing to companies and associations across Canada. As a speaker, trainer and consultant, Christine's passion is discovering an attribute each client can own and helping them to live it and communicate it consistently and with purpose. Christine was recognized by the Province of Manitoba as Business Woman of Distinction in 2013, chaired the Woman Entrepreneur of the Year Awards, served on the executive of the Women Business Owners of Manitoba for seven years and sat as a Judge for the Spirit of Winnipeg Awards for the Winnipeg Chamber of Commerce for five years. She facilitates classes at the Asper School of Business Executive Learning Centre, the Asper MBA program, guest lectures at Red River College, and has acted as an External Examiner for the Entrepreneurship Program at RRC. Perseverance is her greatest attribute and she the looks to the future with anticipation as technology and new talents challenge the way we communicate in the world today.